Hello. Several months ago my students were featured in a video by Cable in the Classroom that was created to demonstrate some of the ways that teachers can utilize the resources they provide to teachers. Viva Productions came and and transformed our classroom into a studio - lights, microphones, high definition cameras, etc. Eric J Smith shot video for the day and then created a 3 minute video that will be distributed by Cable in the Classroom to teachers throughout the country. The video is available on their web site and will be made available to cable networks across America. You can view the online version of the video here. It was a very educational experience for myself and my students. One of the most interesting experiences for me was recording the voice over at RSVP Productions - a local sound studio. The podcast gives greater detail about the background of the project and the experience. Special thanks to everyone that made the production possible including Julie Zastrow - Viva Productions, Kat Stewart - Cable in the Classroom, Eric J Smith for shooting the video, RSVP Productions and Joyce Peters of Kansas City Time Warner. A huge thanks to my students who were movie stars and did an awesome job "on the set". This is a great time to be a social studies teacher in terms of teaching about the election process and democracy. Recently while attending the NCSS Conference in San Diego I discovered another great resource to use with students that teaches the election process from a unique angle. 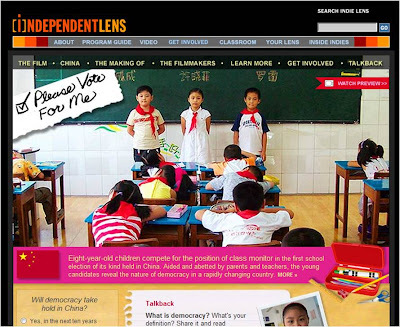 Independent Lens has distributed an amazing documentary named "Please Vote For Me" .The 55 minute documentary follows a student monitor election in a Chinese classroom of 8 year olds. I have used it with my 8th graders and they loved it. If you would like a FREE copy of this DVD please listen to the podcast and then use the links provided in the show notes. Today's podcast is also the first with a new intro and closing. Music used in the background is from Soundzabound - royalty free music for use in K-12 schools. Check it out. Materials Request Form for materials from Independent Lens - including the DVD "Please Vote For Me"
Hello. 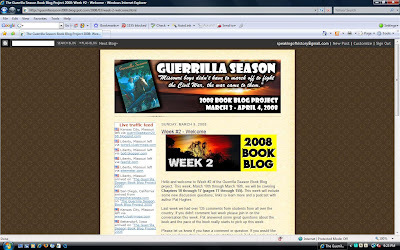 Please take a moment to drop by and check out our 2nd annual Guerrilla Season Book Blog Project. For the second year we have over 300 students and parents in Liberty, Missouri reading a historical novel about the Civil War and are joined by students in California, Illinois and Pennsylvania. The author of the book - Pat Hughes, who lives just outside of Philadelphia - is also joining us again to answer student questions and describe the writing process. The blog includes comments and discussions by participants - using pen names only - along with links to more information, podcast interviews with the author and other interesting facts about the book. Please stop by and check it out, even join us if you want. We just started. The project is live from March 3, 2008 through April 4, 2008 and the blog will remain up after the project is finished. Hello. I've been trying to keep up with my e-mail from listeners and people who check out my classroom web page but I've been getting behind as of late. Today I thought I would try to answer one of my most frequently asked questions - How do you use your note packets in class with your students? I have been using something that I call "note packets" as one method of delivering my content to my students. These packets, and the notes we use with them, are available for download and I receive e-mail often from teachers using them in their own classroom. In this podcast I try to answer the most frequently asked questions about the note packets.